In a number of industries, measurements are made of objects and equipment in the field, and then materials are manufactured to fit those existing objects. Some common industries like this are kitchen counter tops, boat covers, enclosures, or flooring, wall cladding, and stairway coverings or lifts. A common approach within these industries is to create a template on-site from paper, cardboard, or plastic to form the fit of the final materials. The templates are returned to the manufacturer and are used to form or cut the material (such as a kitchen marble countertop, or a boat cover), and the finished product returned to the customer or site for installation. The accuracy of the cut and formed materials is key to success. More and more digital techniques are being used in these industries for measuring the original objects, or for digitizing the manually created templates. This article talks about using photogrammetry to digitize 2D templates. Update: Recently we’ve introduced new methods for 2D Template Digitizing. Please see the Digitize 2D Patterns and Templates with a Camera pages. There are two approaches to turning templates into final cut materials. The traditional method involves manual measurements, and laying out templates on materials and then hand cutting following the template pattern. This is a simplification and each industry has various methods. c. the physical templates do not need to be stored (a hard disk or usb disk suffice!). There is a process that dispenses with the manual creation of the 2D templates in the first place. This process uses a camera right at the client site to perform the measurements. The images are returned (transmitted) to the manufacturer, and after some work in PhotoModeler, a 3D CAD model is exported to your CAD program of choice. Some applications will require panel creation and flattening (CAD software or plugins are available to do this). The remaining steps are similar in terms of QA and cutting the pieces on an automated cutter. Full 3D templating is often more involved and has to be carefully considered but in some industries it makes sense. See the diagram below for a comparison of 2D and 3D workflows. 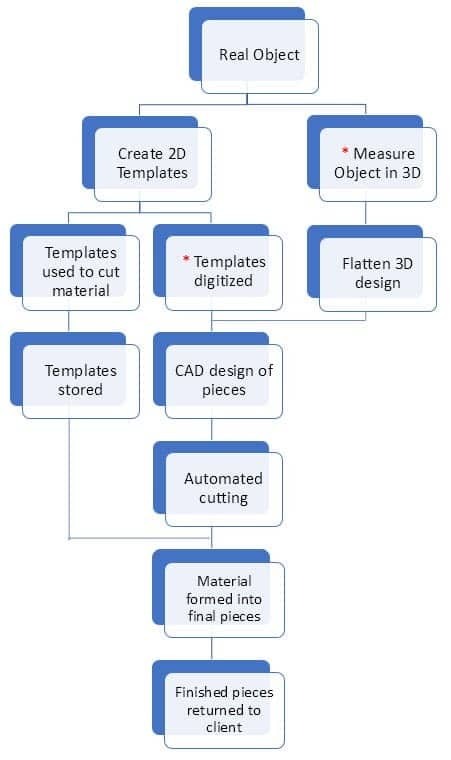 Now that we have had an introduction to 2D and 3D templating here is an overview diagram of the different paths one can take in after-market materials and parts manufacturing. The boxes above with a red * can be carried out by the PhotoModeler photogrammetry software. PhotoModeler can be used in both the 2D and 3D cases. This article focuses on the 2D template digitizing case. The introduction found in this document explains why a full-accuracy photogrammetry package is best for 2D template digitizing with a camera. 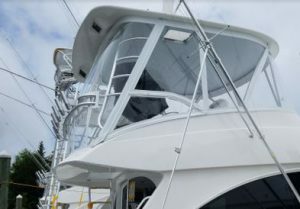 Costa Marine, of New Jersey, is a PhotoModeler customer that manufactures custom marine furniture, soft goods, enclosures, covers, and windscreens. Chris Costa, President of Costa Marine has this to say about PhotoModeler, “We didn’t want technology that could replace anyone, we wanted technology that would help our team work better, easier, and ahead of the curve. Life and technology are moving so fast today, that by the time that the next generation comes on board, they’ll have replaced our hand tools with laptops. We did research and discovered PhotoModeler, and what we thought was going to be hard work has turned out to be a joy. PhotoModeler allows us to get things done that we could only dream of before, and the time and space that it saves us are immeasurable. My only regret is that we didn’t start using it sooner!”. Costa Marine has taken the complex job of creating windscreens from a 3-day process to a 3-hour process through the use of CAD, automated cutters, and PhotoModeler-based template digitizing (see image above for example). Additional information on this case can be found in this Marine Link article. The PhotoModeler Sales (sales@photomodeler.com), and Tech Support (support@photomodeler.com) teams are always available to answer questions and provide guidance. To buy PhotoModeler Standard (product used in procedures above) visit the Ordering page, or to download a demo visit the Downloads Request page.